Faith and action go together (James 2:14-26). There are many ways to live out your faith at Embury. If you haven't had an Embury apple pies, then you haven't lived. 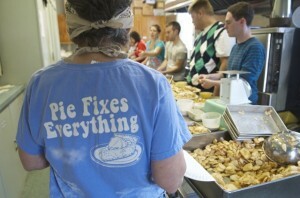 All kidding aside, the apple pies we make and sell have been helping the ministries near and far for over 50 years. With your help, we made pies 4 times in 2013, in September, October, November, and December…. A total of more than 1000 pies!! More than 500 lbs of flour! AND…most importantly, a countless amount of labor (estimate: 1000 hours per pie make season!) donated by our most important ingredient, YOU!! Celebrate your birthday with a gift to help others! HABcore and 180 Turning Lives Around receive donations from the Birthday Box. Your donation can be placed in the Birthday Box in the narthex or in the collection plate. Make checks payable to Embury UMC with the notation "Birthday Box". If you already celebrated your birthday and forgot to donate, it's never too late! Food gift card is a good way to help our ministries. All you have to do is buy a gift card for the supermarket you usually shop and the church receives a rebate. For many children in Monmouth County, summer not only means the end of the school year but also means missing a daily school meal. The St. Luke's Food Pantry in Long Branch serves about 1200 families each month. Donations of baby food, toilet paper and detergent are always appreciated, as well as peanut butter and jelly during the summer months. Also, please recycle your plastic grocery bags with them. A donations box is located near the church entry. Thank you so much for your continuing support.